fruit and making grooves for the seeds, instead of the flesh only occurring around the seeds. Unlike other Annona fruits, the Sugar Apple has segmented flesh. 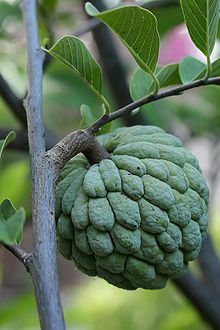 Sugar apple is a fruit of the tree Annona squamosa. It is sweet in taste due to higher fructose and reducing sugar content. Different cultures have many names for the species. In English, the fruit is most widely known as a sugar apple or sweetsop as well as a custard apple, especially in India and Australia (in the latter, a custard apple also refers to Annona reticulata, another closely related species). In Latin America, regional names include anon, anon de azucar, anona blanca, fruta do conde, cachiman, saramuyo, grenadilla (little grenade) and many others. In Brazil, it is called fruta-do-conde, fruta-de-conde, condessa, fruta-pinha, pinha (lit. cone), araticum, ata or anona. In India it is known as ata, aarticum, shareefa, sitaphal, seethaphal or seetha pazham ( literally meaning "Sita's fruit"). In Kerala, it is called aathachakka. Sugar-apple fruit is high in calories and is a good source of iron. It is the most widely cultivated of all the species of Annona, being grown widely throughout the tropics and warmer subtropics, such as Indonesia, Thailand, and Taiwan; it was introduced to southern Asia before 1590. It is naturalized north to southern Florida in the United States and south to Bahia in Brazil, and is an invasive species in some areas. Like most species of Annona, it requires a tropical or subtropical climate with summer temperatures from 25 °C (77 °F) to 41 °C (106 °F), and mean winter temperatures above 15 °C (59 °F). It is sensitive to cold and frost, being defoliated below 10 °C (50 °F) and killed by temperatures of a couple of degrees below freezing. It is only moderately drought-tolerant, requiring rainfall above 700 mm, and will not produce fruit well during droughts.